Gene Fowler’s I Was a Teenage Werewolf tells the story of a troubled teen, Tony, who cannot control his temper. Although otherwise a model student, he continually provokes fights with other teenagers. Police Detective Donovan recommends Tony to psychologist Dr. Alfred Brandon. Brandon, however, has no desire to help Tony. He'd rather use him as a guinea pig for a substance he has invented called scopolomene that causes humans to revert to primitive forms. After an injection, Tony transforms into a werewolf. On separate occasions, he kills two of his classmates. Now a fugitive from justice, Tony returns to Brandon’s lab, confronts Brandon, and kills him, after which Detective Donovan and another police officer shoot and kill Tony. Tony gets into a fight in the opening scene from I Was a Teenage Werewolf. Initially, we see Tony as the embodiment of the psychopathic teenage delinquent. In the opening sequence, he fights with a friend. He attacks relentlessly, picks up a shovel, and swings it wildly. Eventually, the police must break up the fight. But Tony is more than a troubled teen: his behavior verges on the criminally psychopathic. In Rebel Without a Cause (New York: Grove Press, 1944), Lindner commented that teenage psychopaths "invariably show a naive inability to understand or appreciate that other individuals as well have rights: they are also inaccessible and intolerant of the demands and pleas of the community, scornful of communal enterprise and spirit, suspicious of the motives of community-minded people" (8). The film sets up Tony’s character as a case study of a Lindner psychopath.NOTE 4 When Tony’s girlfriend’s parents suggest that he get a job, he scorns their suggestion, pointing to a local bank teller who stole money, disappeared, and subsequently gambled the money away. He shows a complete lack of concern for other people, telling Detective Brandon, "People bug me!" He routinely subjects his girlfriend, Arlene, and his father to verbal abuse. Yet, the film does not hold Tony completely responsible for his actions. Tony tells Arlene: "I say things. I do things. I don’t know why." When Detective Donovan suggests that Tony visit Dr. Brandon, the film adopts the position that juvenile delinquency is a disease. This is typical of Fifties commentaries on the social problems of teenagers and also illustrates how this social issue was conducive to representation in the horror genre. In American Scenarios: The Uses of Film Genre (Middletown, CT: Weslyan University Press, 1989), Joseph Reed argues that the concept of disease is central to the horror film: "Horror is, in fact, several different diseases: each kind of movie embodies, enacts, comes to confront something like a disease . . . Each subgenre has fantastic trappings and results and an intensely empathetic outline and form, so we are alienated and attracted, somewhat as we are by someone who is ill" (76). If horror plays on the audience’s attraction/repulsion for disease, Fifties audiences would have been attuned to the sensational disease of juvenile delinquency. Fine, for example, argued in 1,000,000 Delinquents (Cleveland: The World Publishing Company, 1955) that delinquency, like a physical disease, can be cured: "Just as we are pressing ahead to find the causes and cures for polio, cancer, and multiple sclerosis, so we must press forward to eliminate the causes of juvenile delinquency" (116). In Lindner’s study of delinquency, Rebel Without a Cause, he identified the problem as assuming "More and more the proportions of a plague" (15-16). By the time of a 1954 interview, Lindner saw the youth of America as "literally sick with an aberrant condition of mind formerly confined to a few distressed souls but now epidemic over the earth" (qtd. in Oakley 270). I Was a Teenage Werewolf makes a mild attempt to trace some of Tony’s problems to his home life: his father is weak and his mother is dead. When Tony’s father learns of Tony’s transformation and the murders, he blames himself: "Maybe I should’ve remarried," he tells a reporter. Still, the primary focus is on the inexplicable disease of juvenile delinquency that afflicts Tony. Yet, the complication of the film -- a development that makes it a teen-focused horror film and not a melodrama -- is that the cure is worse than the disease. Dr. Brandon watches his test subject, Tony, in I Was a Teenage Werewolf. Dr. Brandon is a mad scientist of the atomic age. As the consulting psychologist at an aircraft plant, he has on his side the authority of science, medicine, and the corporation. Detective Donovan perceives him to be a philanthropist because he treats troubled teens free of charge, but in reality Brandon views human life as no different than a guinea pig, as he makes clear to his conscience-stricken assistant, Hugo Wagner. Brandon tells Hugh that "mankind is on the verge of self-destruction" and proposes a solution that will "unleash the savage instincts," allowing mankind to start over again. Tony prowls for Dr. Brandon in the final scene from I Was a Teenage Werewolf. Brandon’s malaise is typical of those Fifties thinkers who believed that the world was self-destructing. Nuclear war, communism, anti-communism, conformism, and other Fifties ills were put forth as signs of the imminent breakdown of society. Juvenile delinquency was yet another of these symptoms. Fine, for example, lamented the decline of American society, holding up Okinawan culture as more sane than American culture: "When you compare it with our Western world——where every two minutes a man, woman, or child enters a mental hospital for observation or care, where half our hospital beds are occupied by the mentally diseased, where more than half the ills in the doctor’s office are psychosomatic——Okinawa makes you wonder" (55). A perception of society on the verge of destruction paradoxically motivates both Tony’ psychosis and Brandon’s insane medical experiments. Both men have a deep-seated hatred for society. When Detective Donovan tells Tony he has to learn to adjust, Tony angrily replies, "Adjust to what?" Brandon might give the same reply, since he believes that humans are better off living through their animal instincts and evolving all over again in order to create a less self-destructive society. I Was a Teenage Werewolf locates the horror of juvenile delinquency in a very specific area of authority: the scientific community. The film associates the horrors of science that shaped the Fifties -- The A-bomb, then the H-bomb, both leading to the threat of an impending nuclear war -- with the problem of psychotic teens. Fine tentatively associated delinquency with fear of nuclear holocaust, commenting "that we are living in times of great tension and rapid change goes without saying. What effect the threat of atomic war may have upon the increasing incidence of delinquency, we do not know" (109). However, later studies have made connections between the angst of Fifties teens and the potential doom of nuclear war that hung over their heads. In his study of nuclear culture, Nuclear Fear: A History of Images (Cambridge: Harvard University Press, 1988), Spencer Weart notes that "a psychological survey of young people in the mid-1960s confirmed that in their thoughts of imminent nuclear bombing, reality was reinforcing adolescent fantasies about inadequate and destructive adults" (340). If authority figures had not only failed to provide teenagers with adequate role models but had, insanely, created a weapon capable of destroying the world, then who could be surprised that teenage culture was in degeneration? Commentator Lewis Mumford feared that the suspicion pervading American society would result in decadence. In In the Name of Sanity (New York: Harcourt, Brace, and Company, 1954), he said, "We can posit the familiar forms of these regressive reactions: escape in fantasy would be one: purposeless sexual promiscuity would be another: narcotic indulgence would be a third" (30). Mumford perceived post-WWII America as a world that had lost its sanity: "And the fatal symptom of their [government’s and military’s] madness is this: they have been carrying through a series of acts which will lead eventually to the destruction of mankind" ("Gentlemen" 5). Mumford’s view of a degenerated American state, devoid of reason and living for the moment, is the one posited by Brandon, and the one unconsciously perceived by Tony. Ultimately, I Was a Teenage Werewolf presents a very harsh view of the problem of authority and juvenile delinquency. As Tony and Brandon destroy each other, there seems to be little hope for a solution to the problem. All Detective Donavon can do to help Tony at the end of the film is to kill him. Thus, the horror genre comes to a much more hopeless conclusion about the problem of juvenile delinquency than do mainstream films such as Rebel Without a Cause, The Unguarded Moment, or The Wild One. In each of these films, the audience is left with hope for a cure to the delinquency problem. 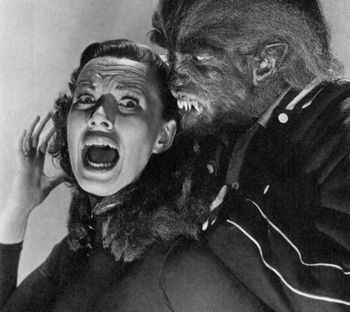 However, the deep-seated suspicion that those in charge are more insane than the diseased youth of Fifties America, which I Was a Teenage Werewolf posits, is presented in another horror film from the same time period. Photo credit: © 1957 Sunset Productions. All rights reserved.